Hip Hop Horaaaaay! 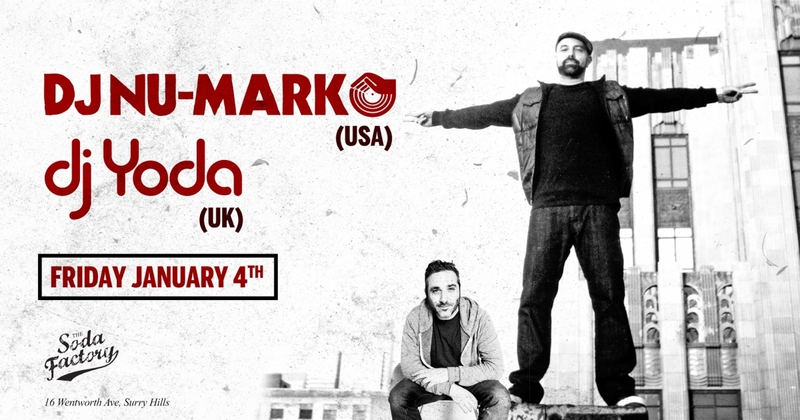 Jumping straight into 2019 with a BANG, The Soda Factory is proud to present a stela double-header line up of international DJ’s – Nu Mark (USA) & Yoda (UK). These turntable legends are bringing the HYPE direct to Sydney for the New Year in this extra special intimate show, so save the date & get in early for your 2019 kick-off ! DJ Nu-Mark: As an original member of the critically acclaimed & pioneering hip-hop outfit Jurassic 5, Nu-Mark’s refined music production and live showmanship regard him as one of the most-innovative DJ’s in music culture. Nu-Mark’s collaborations read like a who’s who of show-business, having worked with Nas, Aloe Blacc, method man, and many more as well as his talent’s being drafted in by the likes of Saturday Night Live & South Park! Don’t miss this truly pioneering legend of the turntable-ist scene. Don’t miss this rare and exclusive intimate show from 2 legends of the party Hip Hop scene. $10 after 8pm | $20 after 9pm.